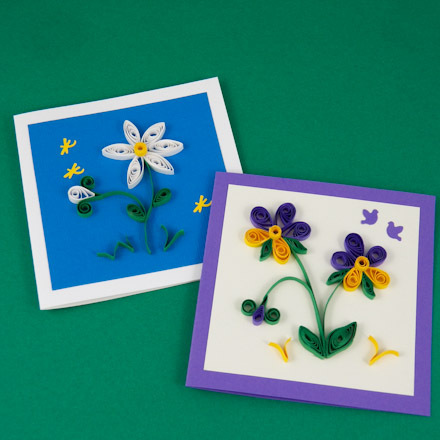 Build on the Basics of Quilling and the quilling design patterns in the project to decorate greeting cards with quilling motifs. The card ideas shown below are based on the easy-to-make Four Patch Card, and use ePapers you can download and print. 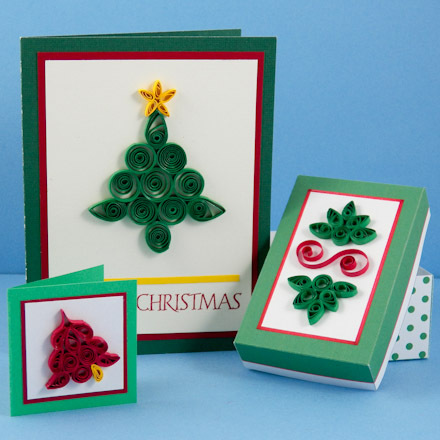 See the Four Patch Card tutorial for detailed instructions in making the cards and how to make quilling designs in the Basics of Quilling. If you are new to card making, review the Greeting Card Class tutorials for ideas and basic techniques. 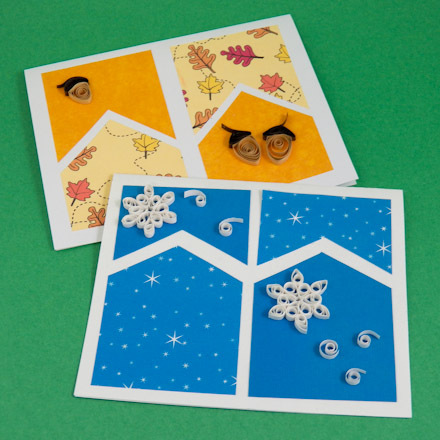 For how to make card blanks and envelopes, see the Four Patch Cards tutorial or see the Envelopes to Make craft project for envelope templates and instructions. Scroll down to see the instructions for the card options. All cards use digital paper that you download and print on white paper. These printed papers are combined with coordinating colored paper or cardstock. Prep work: Download Small snowflakes on blue ePaper and print on white paper or cardstock. 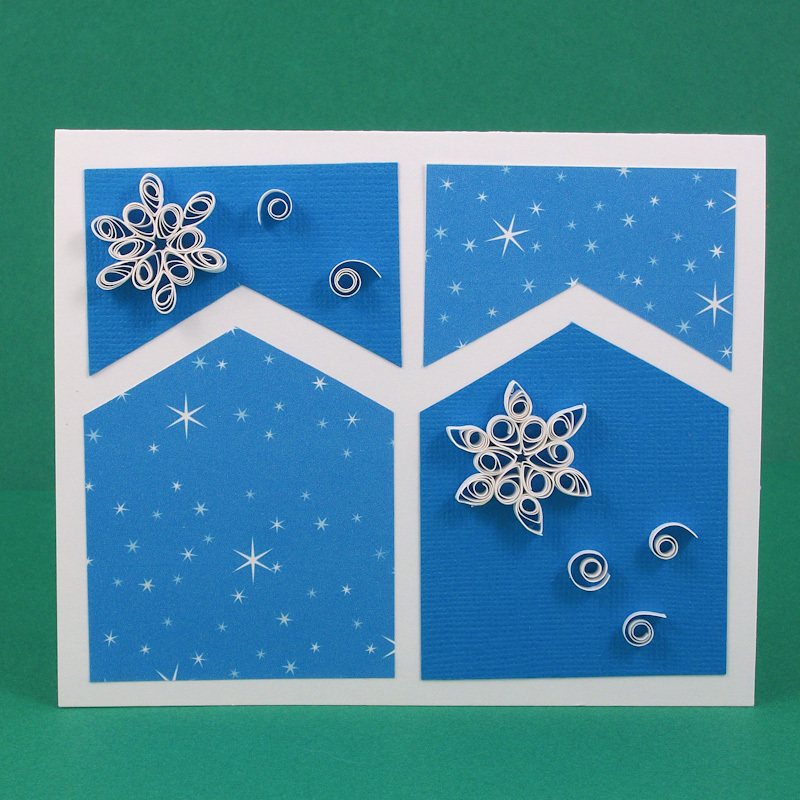 Cut two rectangles measuring 3½" by 2¼"—one from the Small snowflakes ePaper, and the other from the blue cardstock. 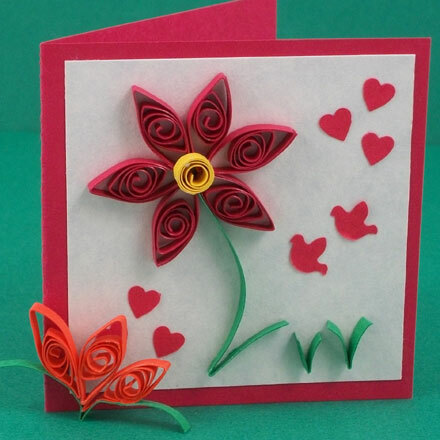 Cut twenty-four 2½" by 1/8" strips of white paper, or cut quilling strips to length. Quilling motifs: Make Snowflakes 1 and 2 on the Snowflake Project Sheet, each snowflake requires twelve white teardrop coils. See the Basics of Quilling for how to make the teardrop coils and join them to form the snowflake motifs. To assemble card: Follow the instructions in the Four Patch Cards tutorial, steps 3 and 4, to cut and arrange the four patches. Glue the snowflakes on the blue cardstock pieces, use the photo of the sample card as a guide. Optionally, wind some 1" by 1/8" strips of white paper into small open coils to further embellish the card front. 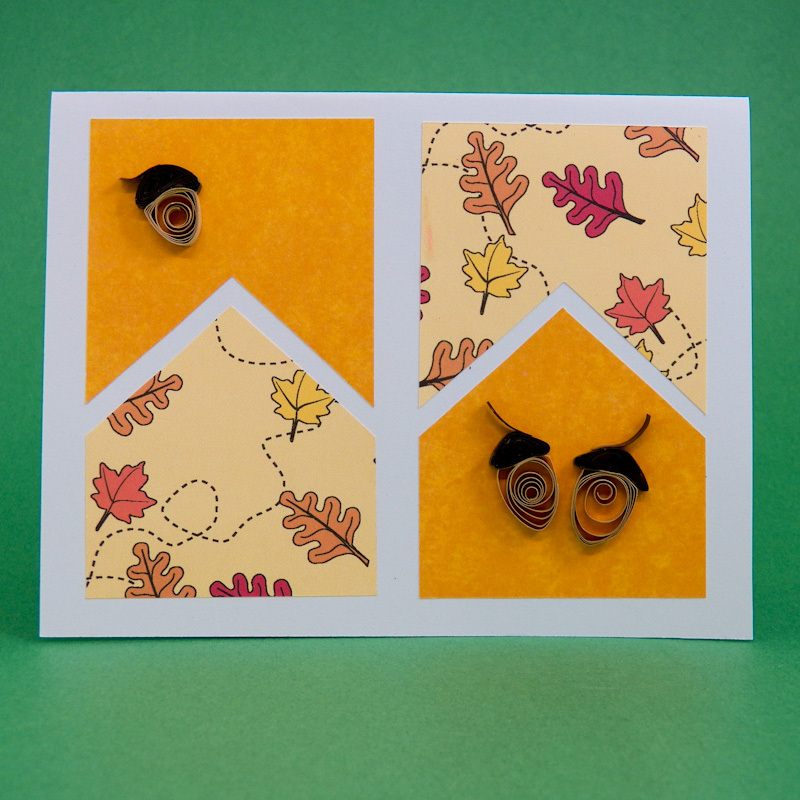 Prep work: Download Fall Leaves on Cream ePaper and print on white paper or cardstock. Cut two rectangles measuring 3½" by 2¼"—one from the Fall Leaves ePaper, and the other from the mustard yellow cardstock. Cut three 8" by 1/8" strips of tan paper, three 6" by 1/8" brown strips, and three ½" by 1/8" brown strips, or cut tan and brown quilling strips to length. 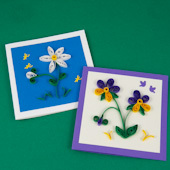 Quilling motifs: Make acorn quilling motifs with one tan and one brown loose closed coil each. Pinch and shape the tan coil with your fingers into an acorn-shape—a rounded triangle works well. Form the acorn caps by pinching the brown coils into an eye-shape and then bend them into a cap-shape. Glue the cap to the top of the acorn nut. Gently curve the short brown strips into stems and glue to the caps. 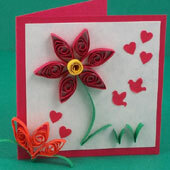 See the Basics of Quilling for how to make the coils and join them to form the acorn motifs. To assemble card: Follow the instructions in the Four Patch Cards tutorial, steps 3 and 4, to cut and arrange the four patches. 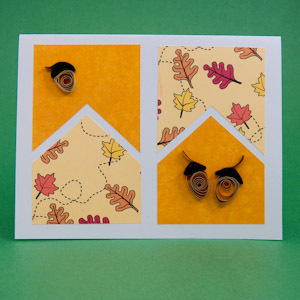 Glue the acorns in a pleasing arrangement on the mustard yellow cardstock pieces, use the photo of the sample card as a guide. Prep work: Download Fall Leaves on Green ePaper and print on white paper or cardstock. Cut two rectangles measuring 3½" by 2¼"—one from the Fall Leaves on Green ePaper, and the other from the pale yellow cardstock. Cut three 12" by 1/8" strips of orange paper, six 6" by 1/8" orange strips, and three ¾" by 1/8" green strips, or cut orange and green quilling strips to length. Quilling motifs: Make each pumpkin quilling motif with three loose closed coils, using 6" orange strips for the smaller pumpkins and 12" orange strips for the larger pumpkin. For each pumpkin, pinch and shape three orange coils with your fingers into an eye-shape and then bend two of them into an arc-shape. Glue the three coils together with the arc-shaped coils on the left- and right-sides. To form a quilling V for the pumpkin leaves, fold a short strip of green paper in half, curl the ends away from the fold, and glue to the top of the pumpkin. 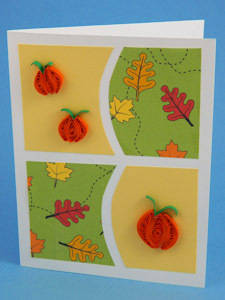 See the Basics of Quilling for how to make the coils and join them to form the pumpkin motifs. To assemble card: Follow the instructions in the Four Patch Cards tutorial, steps 3 and 4, to cut and arrange the four patches. Glue the pumpkins in a pleasing arrangement on the pale yellow cardstock pieces, use the photo of the sample card as a guide. Related crafts: Check out the Basics of Quilling for more about the art of paper filigree.